Set in central Scotland, the historic county of Stirlingshire or Stirling serves as a gateway to the Highlands. The county rests on land stretching out to the Midland Valley in the east and from Firth of Forth to the low hills of Campsie Fells right up to Loch Lomond. At its highest, the volcanic Campsie Fells rise to 1,896 feet and covers a large portion of the land along with the low, extensive ranges of Kilsyth, Fintry and the Gargunnock Hills. Settlements in the county trace back to the Neolithic era. The Antonine wall known locally as Graham’s Dyke, erected by the Romans in AD 143 and connects the Rivers Forth and Clyde. A number of Roman relics are in locations like Camelon and Castlecary. Following the Roman retreat, the native Picts withdrew before the oncoming advances of the Anglo-Saxons and the Scots. The county saw many Stuart Kings reign from Stirling Castle until the amalgamation of the English and Scottish crowns. The county was at the centre of the fight for Scottish Independence and saw numerous exploits of Sir William Wallace and Robert the Bruce plus the three great wars for freedom - Stirling Bridge (1297), Falkirk (1298), and Bannockburn (1314). I am Swift 686, hire me today! 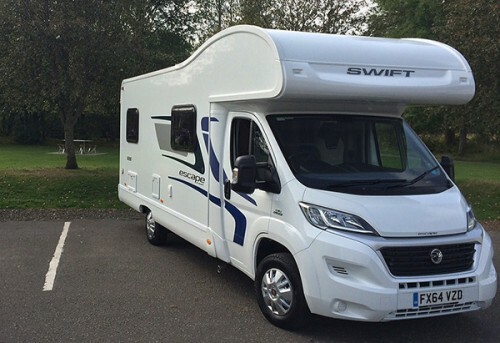 The Swift 686 has the lounge area at the rear which converts to a double bed. There is a fixed double above the cab and the dining area also converts to a further double. Ideally suited for 4 in luxury or 6 with the table conversion.